Also known as butyl rubber or PIB, polyisobutylene is a type of synthetic plastic or resin and consists of polyvinyl chloride that were earlier used in gramophone records and now used for covering materials like wallpapers. Polyisobutylene is also used for manufacturing fiber optic compounds, electrical fluids, agricultural chemicals, paper and pulp, ball bladders and personal care products. One of the major factors that help the market for polyisobutylene is the automotive industry that is continuously on the rise. There is need for important car parts like tubes and tires which ultimately needs polyisobutylene for making the inner liners in tires. The introduction of highly durable tubeless tires the demand for polyisobutylene is estimated to increase remarkably in the future. Thus, the market is likely to boost up the market in the long run. The increasing demand for automotive industries is especially taking place in the developing nations of Middle East and Africa, Latin America, and Asia Pacific. Besides the surge in demand for automotive industry, polyisobutylene is ideal for insulation and electrical waterproofing as well since it is resistant to water, and sunlight. Not only this, they also protect against corrosion and provides protection against high voltage. Due to the aforementioned reasons, the demand for polyisobutylene is more in chemical, and electrical industries, along with plumping industry and also for sealing satellite dish cabling. The global polyisobutylene market is categorized into application and molecular weight. On the basis of application, the market can be segmented into adhesives and sealants, lubricants, automotive, and tires and tubes. Out of these, the segment with tires and tubes is seen to be contributing about 45% to the market with respect to volume. It is also anticipated that tires and tubes segment is likely to continue dominating its position in the years to come due to the rise in automotive sector especially in developing nations and their growth towards building smart cities and smart automobiles. Based on categorization by molecular weight, the global polyisobutylene market is classified into high, medium, and low molecular weights. Among these, the polyisobutylene with high molecular weight is seen to be dominating the market with about 70% of the market with respect to volume. On the other hand the polyisobutylene with medium molecular weight may rise its demand in the global market because of the surge in demand for lubricants that are used for the smooth running of vehicles and its maintenance. These type of lubricants needs polyisobutylene with medium molecular weight for its formation. Thus, the rise in manufacturing and automobile industries is expected to boost the market for polyisobutylene in the future. The global polyisobutylene market is seen to be dominated by the regions of Asia Pacific, Europe, North America, Middle East and Africa, and Latin America. Asia Pacific holds major share of the market and is presumed to continue dominating the market in the future due to the rapid growth of automotive sector in developing nations. Apart from that the market in Europe and North America are also collectively contributing 48.1% share in the overall market. Europe has been traditionally producing and consuming various types of chemicals but now due to the maturity of the market and entry of emerging nations into the scenario, the dominance of Europe had gradually shifted to Asia Pacific. Major companies in the global polyisobutylene market are the Lubrizol Corporation, Ineos Group Ltd., TPC Group Inc., and BASF SE. Polyisobutylene (PIB) is a commercial polymer or elastomer that is used in a number of applications in various industries due to its thermal stability, flexibility, and impermeability to gases. Polyisobutylene an elastomer or synthetic rubber is the only rubber that is impermeable to gases, and was first developed in 1930’s. Polyisobutylene is used in the production of tubeless tires due to its ability to retain air for longer periods. Polyisobutylene is used in various other applications such as lubricants, adhesives, agricultural chemicals, caulks, sealants, paper & pulp, and chewing gum, among others. . Polyisobutylene is also used for damp proofing and maintenance of roof membranes. Rising automotive industry in developing regions such as Asia Pacific and Latin America is expected to propel the tire market during the forecast period. This is further anticipated to fuel the growth of the PIB market, owing to its use in tire manufacturing. Medium molecular weight PIB are also primarily used to manufacture lubricants and adhesives. Demand for polyisobutylene is projected to increase significantly in the next few years considering the growth in the use of medium molecular weight PIB in the lubricants segment in various regions. Asia Pacific dominates the polyisobutylene market in terms of production and demand. Countries such as China, India, Japan, and South Korea are expected to be the key consumers of polyisobutylene. North America is the second largest consuming region. Furthermore, polyisobutylene offers chemical resistance and low permeability to air, moisture and gases. It is used in the manufacture of a range of medical packaging applications such as serum vials, injectable, saline bottles and seals. Therefore, rise in the medical industry in Latin America is also anticipated to fuel the growth of the PIB market during the forecast period. . However, rising environmental concerns owing to the recent PIB spill in Europe is anticipated to slightly hinder the growth of the PIB market during the forecast period. This report analyzes and forecasts the market for polyisobutylene at the global and regional level. The market has been forecast based on volume (Kilo Tons) and revenue (US$ Mn) from 2017 to 2025, considering 2016 as the base year. The study includes drivers and restraints of the global polyisobutylene market. It also covers impact of these drivers and restraints on demand for polyisobutylene during the forecast period. The report also highlights opportunities in the polyisobutylene market at the global and regional level. The report includes detailed value chain analysis, which provides a comprehensive view of the global polyisobutylene market. Porter’s Five Forces model for the polyisobutylene market has also been included to help understand the competitive landscape in the market. The study encompasses market attractiveness analysis, wherein end-users are benchmarked based on their market size, growth rate, and general attractiveness. 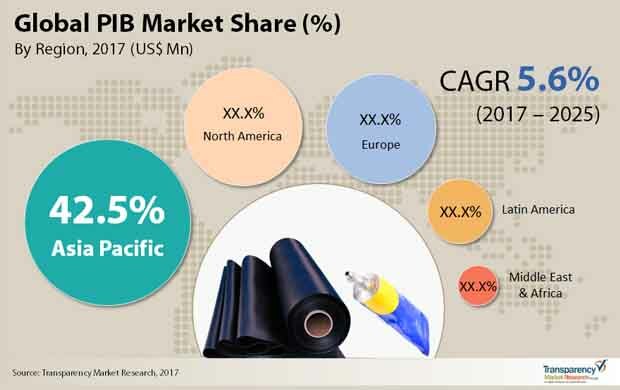 The study provides a decisive view of the global polyisobutylene market by segmenting it in terms of molecular weight (low, medium and high) and applications such tires & tubes, automotive, lubricants, adhesives & sealants, others (medical, chewing gum, detergents, and dispersants etc.). These segments have been analyzed based on present and future trends. Regional segmentation includes current and forecast demand for polyisobutylene in North America, Europe, Asia Pacific, Latin America, and Middle East & Africa. The report provides the actual market size of polyisobutylene for 2016 and estimated market size for 2017 with forecast for the next eight years. The global market size of polyisobutylene has been provided in terms of volume and revenue. Market volume has been defined in kilo tons, while market revenue is in US$ Mn. Market numbers have been estimated based on molecular weight and key applications of polyisobutylene. Market size and forecast for numerous end-users have been provided in terms of global, regional, and country level markets. Secondary research sources that are typically referred to include, but are not limited to company websites, annual reports, financial reports, broker reports, investor presentations, SEC filings, CSA Global, Rubber World, World Petrochemical Organization, World Tire Magazine, Association of Rubber Manufacturers, Indian Petrochemical Institute, FAO, internal and external proprietary databases, and relevant patent and regulatory databases such as Hoover’s, oneSOURCE, Factiva and Bloomberg, national government documents, statistical databases, trade journals, market reports, news articles, press releases, and webcasts specific to companies operating in the market. The report comprises profiles of major companies operating in the global polyisobutylene market. Key players include BASF SE, TPC Group Inc., Ineos Group and Braskem amongst other manufacturers. Market players have been profiled in terms of attributes such as company overview, financial overview, business strategies, and recent developments.